Photographed in 2005, Donald Trump stands in front of 515 N. County Rd., the estate he bought at auction for about $41 million, renovated and then sold in 2008 at a recorded $95 million. A U.S. senator wants the Treasury Department to turn over records of a lucrative Palm Beach real estate deal President Donald Trump made with a Russian oligarch a decade ago. Sen. Ron Wyden, D-Oregon, is asking for financial records of the deal between Trump and Russian fertilizer billionaire Dimitry Rybolovlev to be turned over to the Senate Finance Committee. The committee is looking into Trump's ties to Russians. 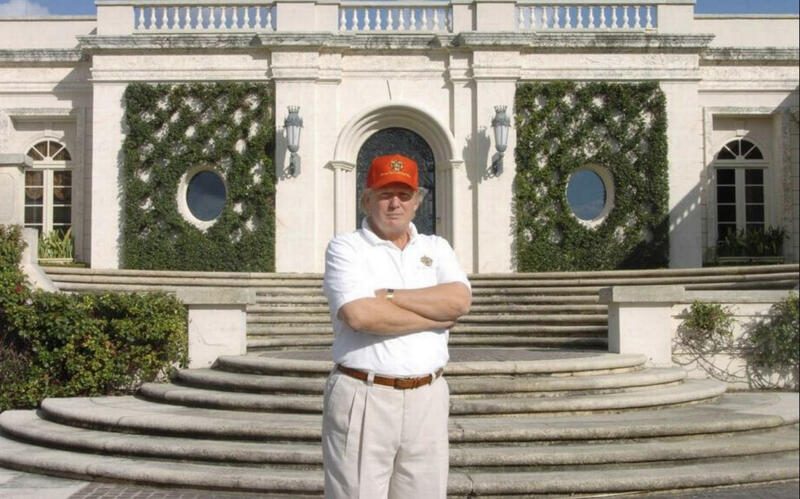 Trump bought the 6.3-acre property at 515 N. County Rd/ in the town of Palm Beach in 2004 and sold it in 2008. The Guardian newspaper called it "the most expensive residential sale ever recorded." Wyden also sits on the Senate Intelligence Committee investigating alleged collusion between the Trump campaign and Russia. He said in a letter to the Treasury Department that the transaction is being looked at by special counsel Robert Mueller.